Ronald Reagan’s skill as "The Great Communicator" led conservatives to a historic victory in 1980, followed by his resounding re-election in ’84. President Reagan’s moving speeches helped restore our vision of America’s greatness and guided the country to a period of unprecedented prosperity and renewed vigor. 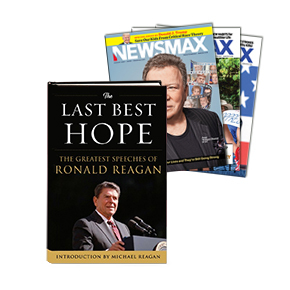 Now you can relive Reagan’s most powerful speeches this special collection, The Last, Best Hope — The Greatest Speeches of Ronald Reagan. America has seen many well-spoken conservative leaders, but few have possessed the capacity to communicate their ideas and visions as powerfully as did Reagan. His ability to captivate and inspire put him head and shoulder above the rest. From the time he arrived on the political scene in 1964, throughout his presidency and beyond, Ronald Reagan used his speeches to inspire the American people and ultimately reshape the world. When he spoke, Reagan said, he was "preaching a sermon." Here in this collection of twenty-eight speeches spanning the Reagan era, you’ll read for yourself these inspirational "sermons" and enjoy the many photographs included. From his first speech in the political arena in 1964 to his last letter, informing Americans of his Alzheimer’s disease, Ronald Reagan’s words show a profound belief in God, freedom, individualism, limited government, and his great love for his country. This book should be a permanent treasure in your personal library!